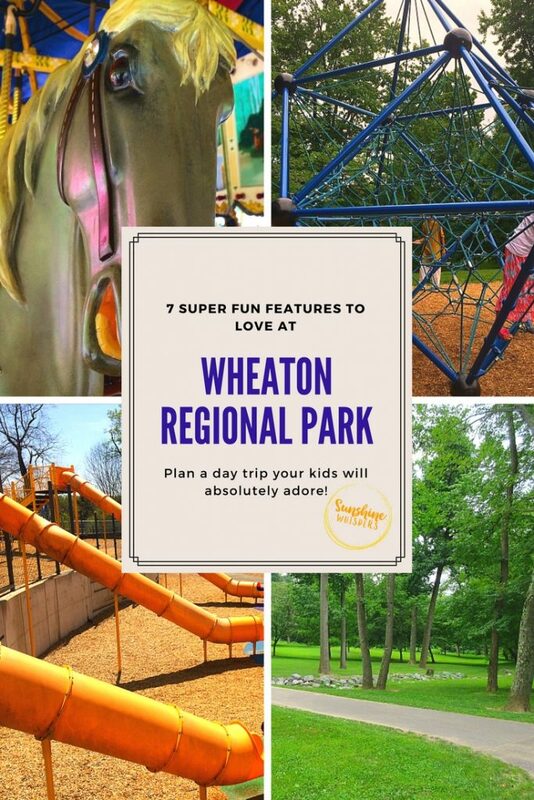 These seven features at Wheaton Regional Park are so much fun you can’t help but delight your kids with a day trip to the park! I could hear the screams of delight as my 2-year shot down the slide. 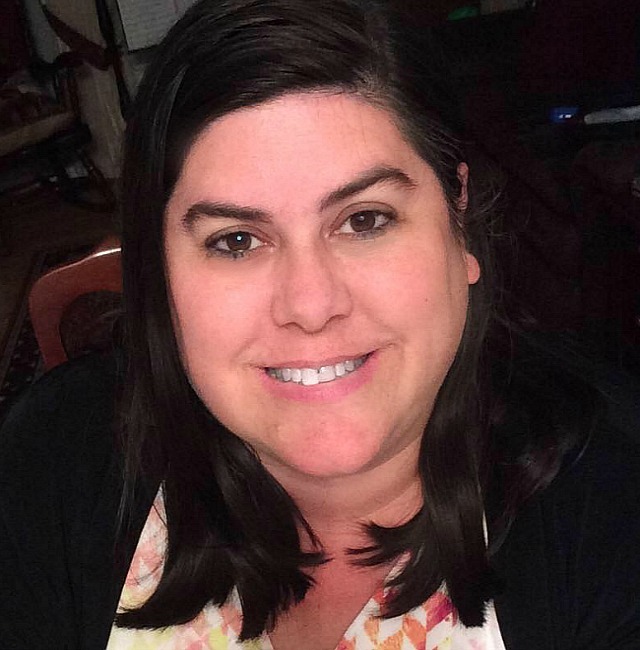 At first I was very nervous. I hovered, waited for her to get stuck, and wondered if her stout 2-year old legs would make it up the slide to the ladder. 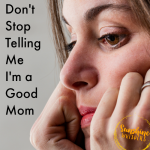 But she did. Actually, she did it about 20 times in a row. The tube slides were so much fun! After a while she looked for something else to do. How about seeing if we could climb to the top of the big blue mountain? 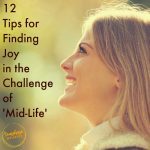 Or maybe dig for treasure in the sand box, or give Minnie Mouse a ride on the purple Barney-esque dino. After about an hour of intense playing I hinted that there was a carousel at this park and my daughter’s eyes got as big as saucers. Really? How is this even possible? The park is already so much fun just because of the playground? There are actually quite a few reasons to love the Wheaton Regional Park in Montgomery County, MD. These are seven features that keep us coming back again and again! If you have younger kids, don’t worry.. the slides at the Adventure Playground are totally awesome for even little kids. My 2 year old couldn’t stop hurling herself down each of the tubes. 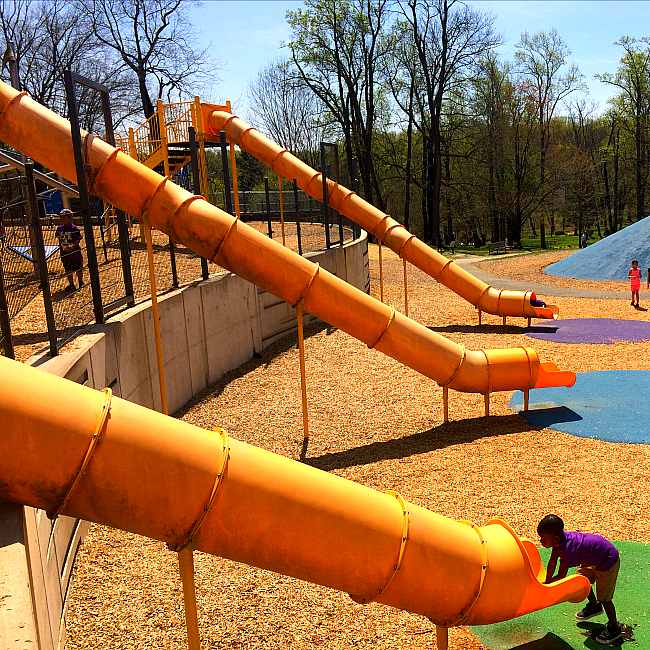 Of course, older kids will love these slides too. They are pretty fantastic… and fast. These are not the only slides (there are a few in the toddler area too. But these are definitely a highlight! 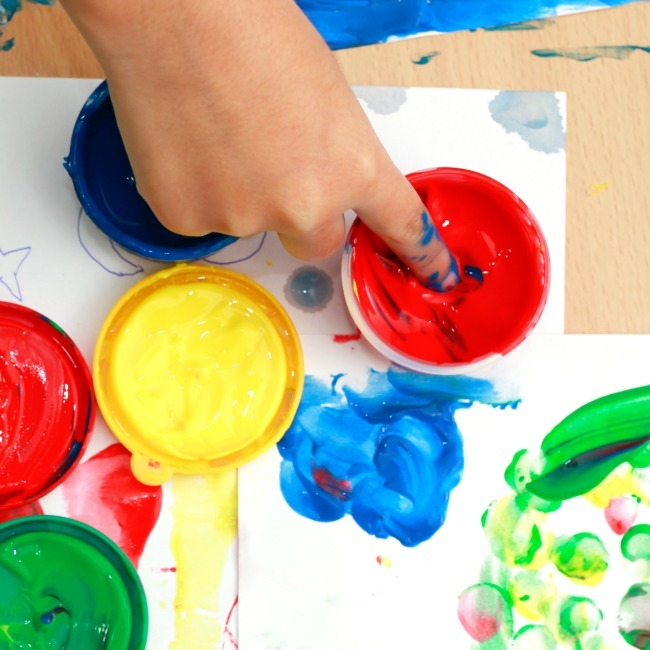 The toddler and young kid play area is next to the older kid area, but it is large enough, and with just enough separation that your toddlers and young 2-3 year old’s will be perfectly content to stay there. 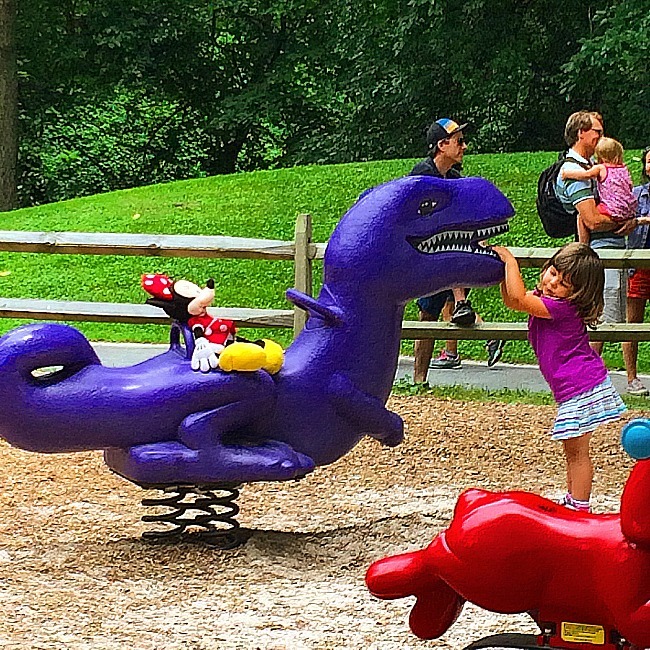 There are ride on play equipment like the purple dinosaur, a large sandbox, plenty of age appropriate swings, and fun animal climbing structures. This young kid playground equipment will definitely keep your kids happy. 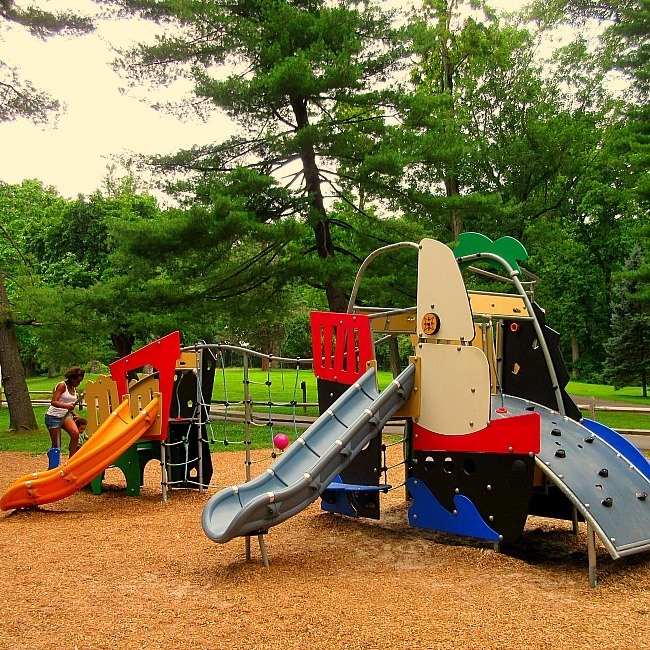 The Wheaton Regional Park playground area is quite big, so you probably can’t watch your toddler here and your 5 year old in the older kid area, but if both of your kids are young, there are plenty of shady places to sit in this area. Ok, this big blue mountain is just cool. It is bigger than this picture lets on too… on any given sunny day, kids will love conquering this big blue high peak, chasing each other, and pretending they are kings and queens of the world. I have no idea what to call this so I will call it a climbing knot. 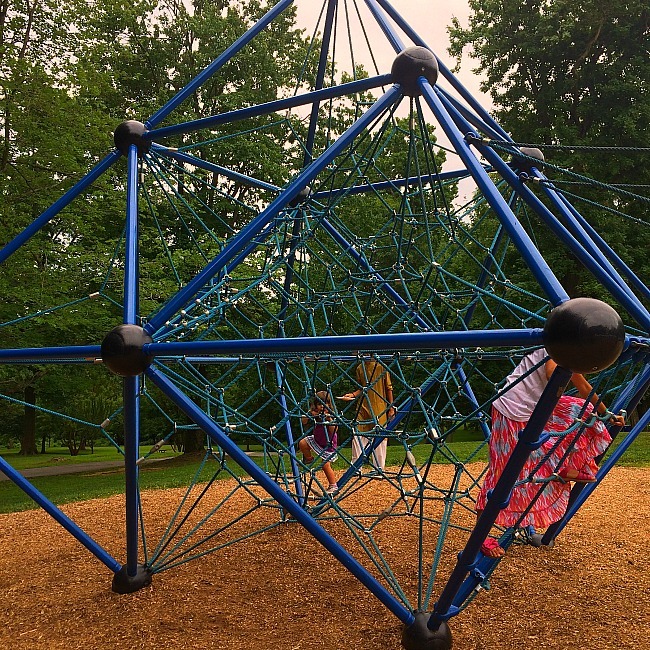 It is such an interesting climbing structure to conquer and is relatively easy for even preschoolers to get up and get back down. Don’t forget to pack a lunch because the grounds of Wheaton Regional Park are really expansive, with tons of picnic tables and covered picnic areas. The trees in the park are tall and provide plenty of shade. 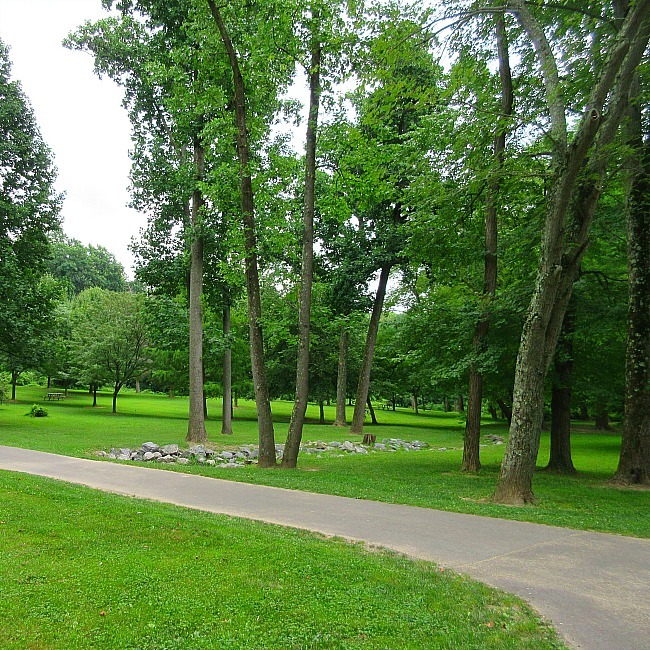 The walking paths are wide and there is plenty of open grassy area to spread out. Don’t forget to bring cash and take a spin or two on the historic Herschell Spillman Company 1915 turn-of-the-century carousel. 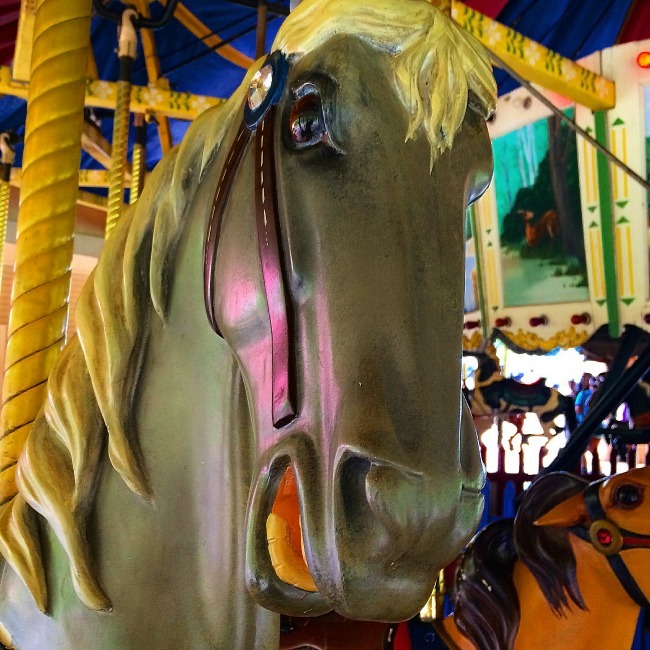 Rides are $2.50 per person (kids under 2 are free) and the carousel is open daily from mid-May through early September and on weekends in May and September. And right next to the carousel is this super cute miniature train. Like the carousel, tickets cost $2.50/person and it is open daily during the summer. 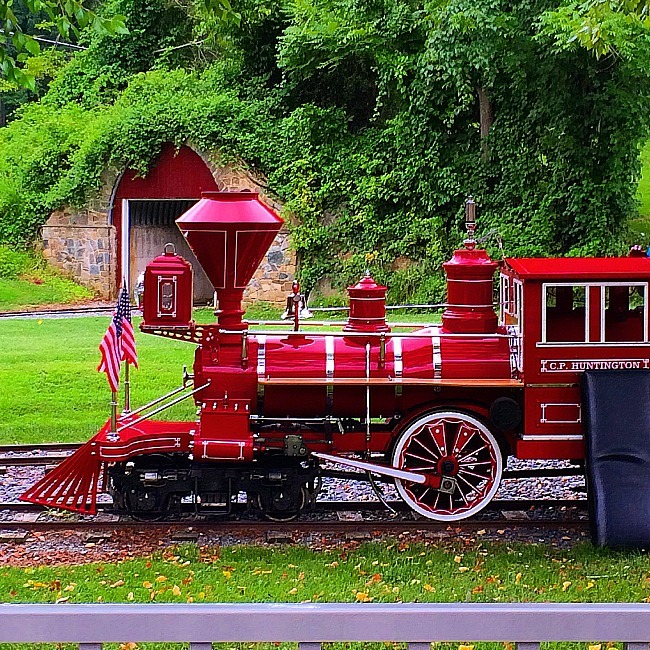 This train is a replica of a historic train that is suitable for kids of all ages and the ride lasts approximately 12 minutes. 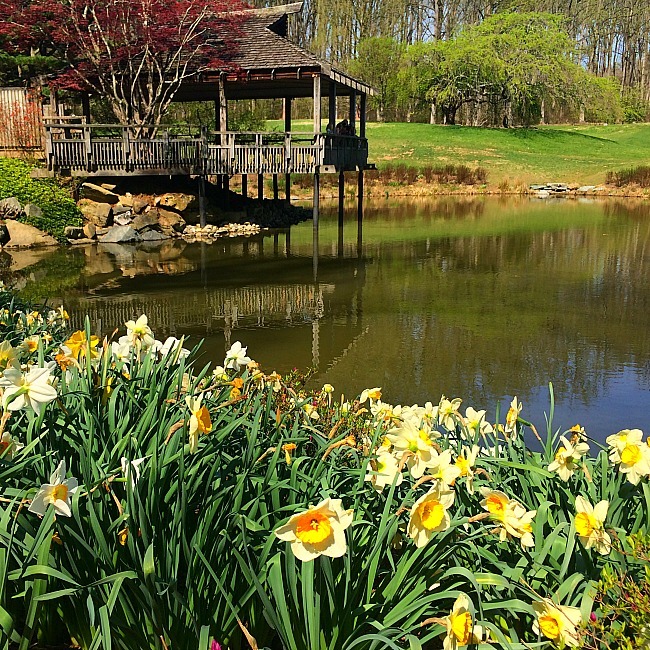 If you visit Wheaton Regional Park to play, make a day trip of it and visit Brookside Gardens too! Brookside Gardens is actually part of Wheaton Regional Park and you can walk between the two parts of the park on a nice walking path. Of course, if you don’t really want to walk between the parks, it is easy enough to drive to Brookside Gardens. 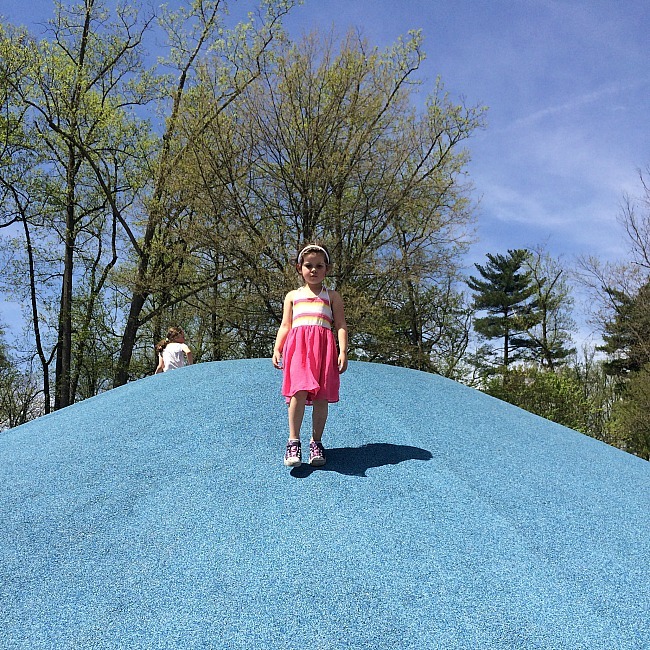 I reviewed Brookside Gardens, which is amazingly fun for kids too! There are plenty of parking areas at Wheaton Regional Park; one near the train and carousel, and one near the Adventure Playground. There are plenty are public bathrooms too and we have always found them to be clean.